The following report was issued by the United Nations Independent Commission of Inquiry on the 2014 Gaza conflict earlier this month. 1. On 23 July 2014, the Human Rights Council, by resolution S-21/1, decided to urgently dispatch an independent, international commission of inquiry to investigate all violations of international humanitarian law and international human rights law in the Occupied Palestinian Territory, including East Jerusalem, particularly in the occupied Gaza Strip, in the context of the military operations conducted since 13 June 2014, whether before, during or after. Pursuant to resolution S-21/1, the President of the Council appointed three experts to the commission: William Schabas (Chair), Mary McGowan Davis and Doudou Diène. 2. The commission formally began its work on 16 September 2014. Following the resignation of Professor Schabas on 2 February 2015, the President of the Council designated Justice Davis as Chair. The Office of the United Nations High Commissioner for Human Rights (OHCHR) established a secretariat to support the commission. Notwithstanding the urgency expressed by the Council to dispatch the commission, the secretariat was not fully constituted until the end of November 2014. 14. The hostilities of 2014 erupted in the context of the protracted occupation of the West Bank, including East Jerusalem, and the Gaza Strip, and of the increasing number of rocket attacks on Israel. In the preceding months, there were few, if any, political prospects for reaching a solution to the conflict that would achieve peace and security for Palestinians and Israelis and realize the right to self-determination of the Palestinian people. 15. The blockade of Gaza by Israel, fully implemented since 2007 and described by the Secretary-General as “a continuing collective penalty against the population in Gaza” (A/HRC/28/45, para. 70), was strangling the economy in Gaza and imposed severe restrictions on the rights of the Palestinians. Two previous rounds of hostilities in the Strip since 2008 had not only led to loss of life and injury but also weakened an already fragile infrastructure. Palestinians have demonstrated extraordinary resilience in recent years, living in an environment scarred by physical destruction and psychological trauma. In the West Bank, including East Jerusalem, settlement-related activities and settler violence continued to be at the core of most of the human rights violations against Palestinians. In the absence of any progress on the political front, the risk of a flare-up of the situation was evident. 16. In the meantime, threats to the security of Israel remained all too real. Palestinian armed groups increasingly launched rockets during June and July 2014. The discovery of tunnels leading into Israel added to the sense of insecurity. According to one witness, residents of her kibbutz experienced regular panic attacks after the discovery of a tunnel in March 2014 and the explosion of an alleged tunnel exit on 8 July. Several other infiltration attempts were thwarted by the army during July and August. 17. The events of summer 2014 were preceded by an agreement, reached on 23 April 2014 between the Palestinian Liberation Organization and Hamas, which sought to end Palestinian divisions. On 2 June 2014, President Abbas declared the formation of a Government of national consensus. The Government had yet to assume its full responsibilities in Gaza when active hostilities broke out in the Strip in July 2014, thereby leaving Hamas exercising government-like functions, as had been the case since June 2007. 18. On 12 June 2014, three Israeli teenagers were kidnapped and brutally murdered in the West Bank. In response, Israel launched an extensive search and arrest operation, which lasted until their bodies were found, on 30 June. On 2 July, a 16-year-old Palestinian teenager from East Jerusalem was viciously murdered – burned alive – and his body discovered in West Jerusalem in what appeared to be an act of revenge for the murdered Israeli teenagers. Tensions in the West Bank, including East Jerusalem, ran high, and were further fuelled by a rise in extreme anti-Palestinian rhetoric. Widespread protests and violent clashes ensued between Palestinians and the Israel Defense Forces. 19. On 7 July 2014, the Israel Defense Forces commenced operation “Protective Edge” in the Gaza Strip, with the stated objective of stopping the rocket attacks by Hamas and destroying its capabilities to conduct operations against Israel. After an initial phase focused on airstrikes, on 17 July 2014, Israel launched a ground operation, which it declared sought to degrade “terror organisations’ military infrastructure, and [… neutralize] their network of cross-border assault tunnels”. A third phase began on 5 August, and was characterized by alternating ceasefires and ongoing air strikes. The operation concluded on 26 August, when both Israel and Palestinian armed groups adhered to an unconditional ceasefire. 20. Palestinians and Israelis were profoundly shaken by the events of the summer of 2014. 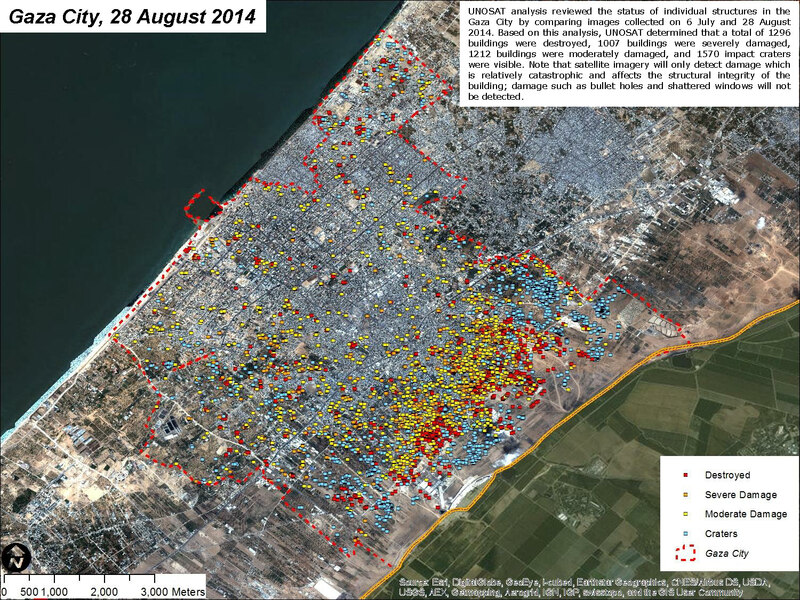 In Gaza, in particular, the scale of the devastation was unprecedented. The death toll alone speaks volumes: 2,251 Palestinians were killed, including 1,462 Palestinian civilians, of whom 299 women and 551 children; and 11,231 Palestinians, including 3,540 women and 3,436 children, were injured (A/HRC/28/80/Add.1, para. 24), of whom 10 per cent suffered permanent disability as a result. While the casualty figures gathered by the United Nations, Israel, the State of Palestine and non-governmental organizations differ, regardless of the exact proportion of civilians to combatants, the high incidence of loss of human life and injury in Gaza is heartbreaking. 21. The death of six civilians in Israel and 67 soldiers and the injury of up to 1,600 others were also the tragic result of the hostilities. According to official Israeli sources, rockets and mortars hit civilian buildings and infrastructure, including schools and houses, causing direct damage to civilian property amounting to almost $25 million. The hostilities caused immense distress and disruption to the lives of Israeli civilians, especially those living in the southern regions. In addition to the constant threat of rocket and mortar attacks, the Israelis interviewed by the commission expressed particular anxiety about the new threat of assaults from tunnels penetrating into Israel. One Israeli woman said that “the tunnels are scarier than the rockets because there’s no chance of being warned”. The sense of panic among many Israelis was exacerbated by the short, often insufficient, time to conduct effective emergency procedures. 22. In Gaza, as Palestinians struggled to find ways to save their own lives and those of their families, they were confronted with intense attacks, with no way of knowing which locations would be hit and which might be considered safe. People began to move from one place to another, only to encounter attacks in the new neighbourhood, and they would have to move on. Closed into the Strip, with no possibility to exit at times, 44 per cent of Gaza was either a no-go area or the object of evacuation warnings. These terrifying circumstances created a sense of entrapment, of having “no safe place” to go. 23. Alongside the toll on civilian lives, there was enormous destruction of civilian infrastructure in Gaza: 18,000 housing units were destroyed in whole or in part; much of the electricity network and of the water and sanitation infrastructure were incapacitated; and 73 medical facilities and many ambulances were damaged. Many Palestinians were uprooted from their homes or temporary shelters multiple times; at the height of the hostilities, the number of internally displaced persons reached 500,000, or 28 per cent of the population. The effects of this devastation had a severe impact on the human rights of Palestinians in Gaza that will be felt for generations to come. The West Bank, including East Jerusalem, witnessed a period of heightened tensions and widespread human rights violations, including the fundamental right to life, which were overshadowed by the tragic events in Gaza. 24. The impact of the hostilities in Gaza cannot be assessed separately from the blockade imposed by Israel. The blockade and the military operation have led to a protection crisis and chronic, widespread and systematic violations of human rights, first and foremost the rights to life and to security, but also to health, housing, education and many others. According to international human rights law, Israel has obligations in relation to these rights and must take concrete steps towards their full realization. In that context, while fully aware of the need for Israel to address its security concerns, the commission believes that the Gaza Reconstruction Mechanism, put in place with the assistance of the United Nations to accelerate efforts to rebuild destroyed houses and infrastructure, is not a substitute for a full and immediate lifting of the blockade. 25. Palestinian and Israeli children were savagely affected by the events. Children on both sides suffered from bed-wetting, shaking at night, clinging to parents, nightmares and increased levels of aggressiveness. In addition, according to the United Nations Children’s Fund, in Gaza, more than 1,500 children were orphaned. Anas “Bader” Qdeih, aged 7, was seen pleading for help from people fleeing Khuza’a while holding his intestines, which were coming out of his abdomen, “I don’t want to die. Don’t leave me.” He died soon afterwards, after his medical evacuation was delayed.